Air-conditioned rooms feature modern design and include a plasma satellite TV, minibar, safe and a private bathroom with hairdryer, slippers and bathrobes. There is a lounge-reading room at the Vasanta Hostal Boutique. Free coffee, tea, and pastries are served daily from 08:00 to 10:30. Several bars, restaurants and shops are within 5 minutes’ walk. 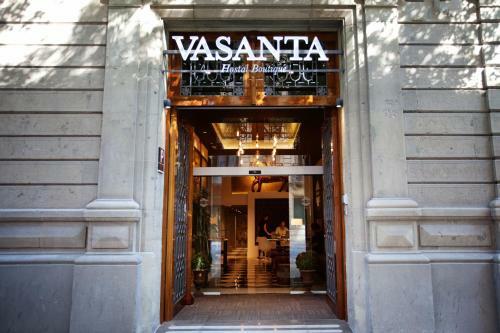 The Vasanta offers bicycle rental and is 4 minutes’ walk from Passeig de Gracia. Plaza Catalunya, with its FGC Train and Metro Stations and airport bus stop, is 400 metres away. You can walk to Barcelona Cathedral, Las Ramblas and the Gothic and Born districts within 8 minutes. Hotel Vasanta is 20 minutes’ walk from Gaudí’s Sagrada Familia. This chic, air-conditioned room comes with 1 double or 2 single beds and features free Wi-Fi and modern design. It includes a plasma satellite TV, minibar, safe and a private bathroom with hairdryer, slippers and bathrobes. Please note that reception is open from 08:00 to 00:00 midnight. This more spacious room features a balcony, free Wi-Fi and modern design. It includes a kettle with free teas and infusions, a plasma satellite TV, iPod dock, minibar, safe and a private bathroom with hairdryer, slippers and bathrobes. Rate: € 77.50 ... € 180.00; select dates below to get current rates. This chic, air-conditioned room features a furnished terrace, free Wi-Fi and modern design. It includes a plasma satellite TV, minibar, safe and a private bathroom with hairdryer, slippers and bathrobes. Rate: € 70.00 ... € 180.00; select dates below to get current rates. This air-conditioned room features a flat-screen TV with satellite channels. It includes a safe, wardrobe and a desk. Heating is also available. The bathroom has free toiletries, bathrobes and a hairdryer. Fitted with wooden floors, this spacious air-conditioned room features soundproofing and seating area. It includes a kettle with free teas and infusions, and a flat-screen TV with satellite channels. The bathroom offers a spa bath, hairdryer, bathrobes and free toiletries. Rate: € 116.82 ... € 180.00; select dates below to get current rates.